In 2012, Tom Ford released his Jardin Noir collection for his Private Blend line of fragrances. The collection consisted of four supposedly dark, twisted, “bewitching” takes on traditionally sweet, innocent flowers: narcissus, hyacinth, rose and lily. 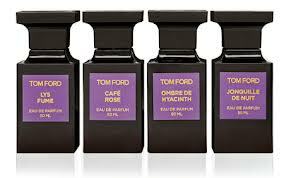 The fragrances are: Café Rose, Jonquille de Nuit, Ombre de Hyacinth and Lys Fume. I have three of the fragrances (Café Rose, Lys Fumé and Ombre de Hyacinth) and have tested two of them but, for reasons of length, this review is solely for Ombre de Hyacinth. Top notes are galbanum, violet leaf, magnolia petals and olibanum [frankincense]; middle notes are hyacinth, pink pepper and jasmine; base notes are galbanum, benzoin and musk. The very first impression I had of Ombre de Hyacinth was soap. Light, airy, aldehydic, floral soap bubbles with an underlying note of powder. Mere seconds later, there was a strong note of zesty, fresh lemon and lime. The zesty lemon soap image was replaced after ten minutes by galbanum’s bitter greenness atop a woody element. Galbanum is the bracingly bitter, distilled oil from a Persian shrub and it has a definite greenness; sometimes, it also has an earthy or slightly resinous undertone. Here, it was mostly just sharp, mossy,bitter, and fresh. On occasion, it faintly resembled the dark soil of a freshly tilled garden, but I had a much less earthy experience than some. There was also some sharp black pepper which added an even greater bite to the fragrance. The peppered wood notes continued to increase in prominence, though the scent was still very green and dark. Thirty minutes in, there was a hint of musky jasmine. For those who struggle with jasmine, you might be relieved to know that it only lasted about twenty minutes on my skin before vanishing, and that it was always very sheer and light. All that was left was that impression of black pepper and wood with some amorphous “floral” notes, soap, and a hint of powder. There was the mere suggestion of hyacinth but, at this point, it was far from strong. It most certainly feels nothing like the actual flower to my nose and it’s a definite disappointment. metallic smelling, green and aqueous note that is common in modern masculine and unisex fragrances, providing a fresher and non-retro note compared to traditional sweet violet. Yes, metallic, green and simultaneously aqueous was exactly what the florals smelled like. That mélange of notes, when combined with the bitter greenness of the galbanum and the soapy aspect of the aldehydes, was quite an odd twist on the typical fresh, Spring-like floral fragrance. And I can’t say I was crazy about it. After about ninety minutes, the scent softened further becoming just some vaguely amorphous impression of freshness: lightly powdered, lightly soapy, lightly woody, lightly aquatic, fresh florals with a hint of greenness. Ombre de Hyacinth remains that way until shortly before the fifth hour when — finally — the hyacinth arrives on the scene. On par with the rest of the perfume, it is extremely light, airy, tinged by soap (again), endlessly fresh, and very redolent of Spring. I feel as though I’m repeating myself ad nauseam, but I can’t help it. This is not a complicated scent. And it’s about as “dark” and twisted as a poodle. Personally, I would have much preferred a more concentrated essence of hyacinth instead of something that is really akin to a generic, fresh floral which just merely happens to have some quiet hyacinth touches. I would also have preferred something far less soapy and aquatic. However, for those who like fresh, clean florals that are sheer (bordering on translucent), Ombre de Hyacinth may be perfect. This is not a strong floral or even a strong hyacinth fragrance. Everything about the scent is light — right down to its sillage. In the opening hour, the perfume’s projection is moderate and, thereafter, it drops to become very close to the skin. Its gauziness makes it extremely office-friendly. Yet, it has surprising tenacity for something so airy and translucent. All in all, Ombre de Hyacinth lasted just under ten hours on my perfume-consuming skin. Nonetheless, I think it’s hugely overpriced for what it is. $205 at the low end of the scale seems very high for a light, fresh, soapy floral scent. It’s not exactly an uncommon category of fragrances, after all. After about fifteen minutes of walking around inside a Monet painting, the fantasy starts to fray at the hem and disintegrate. The abstract floral heart becomes very soapy and loses its best characteristics. There’s nothing narcotic or illicit in a rental vacation cottage out in the country, as clean and quaint as it might be. It smells good, but the composition flattens in front of my eyes (or nose) and loses any depth, shadows, and “decadence” that Ford aspired to have there. [¶] The dry-down remains bathroomy. I experienced a lot more woody, peppery notes than she seems to have done — not to mention that disconcerting violet leaf metallic, aquatic accord — but, yes, it does really evoke a cottage out in the British countryside, especially once the more peppery notes subside. A less charitable person might just say it epitomizes expensive hotel soap. Or, as one poor sod on Fragrantica wrote, “This on me smells just like Carpet Fresh and Irish Spring soap – for hours”…. Cost & Availability: For some odd reason, none of the Jardin Noir fragrances are listed anywhere on Tom Ford’s website. They are, however, available at numerous high-end department stores where its price is like that of other Tom Ford fragrances: $205 for a 50 ml/1.7 oz bottle, or $495 for a 200 ml/8.45 oz bottle. In UK pricing, they sell for £135.00 or £195.00, depending on size. In the US, you can find the fragrance at: Bergdorf Goodman, Neiman Marcus, Nordstrom, Saks Fifth Avenue, and many others. In the UK, you can find it at Harrods or Selfridges. Elsewhere, Tom Ford fragrances are carried in numerous different countries; hopefully, you can find one near you using the store locator on the Tom Ford website. Samples: If you are intrigued, but are also sane enough not to want to spend such a large amount without testing it out first, I suggest stopping by one of the stores listed above for a free sniff. 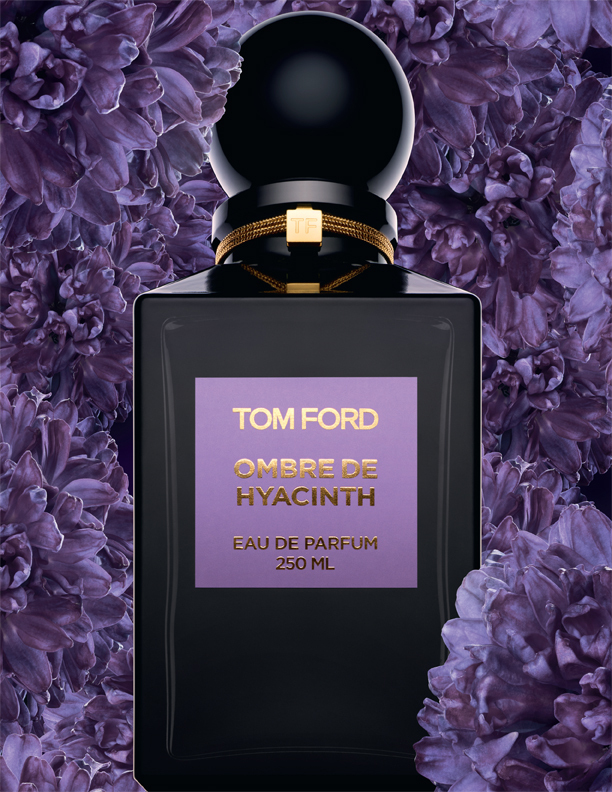 However, you can also find samples of Ombre de Hyacinth starting at $3 on Surrender to Chance, or on other decant/sample sites like The Perfumed Court. I think Surrender to Chance has the best shipping: $2.95 for any order, no matter the size, within the U.S., and $12.95 for most orders going overseas. (It’s a wee bit higher if your order is over $150.) International shipping has leaped up in price (from $5.95) due to the U.S. Postal Service’s recently increased prices. This entry was posted in Florals, Fragrances, Perfume Review, Tom Ford and tagged Ombre de Hyacinth perfume review, perfume, perfume review, Private Blend Ombre de Hyacinth, TF, Tom Ford Ombre de Hyacinth, Tom Ford perfumes, Tom Ford Private Blend by Kafkaesque. Bookmark the permalink. The fact that I know I tried this fragrance and remember so little about it says a lot about it, IMO (perhaps I sent you the remainder of the sample?). Very, very “meh” and this one is definitely not worth $205. Honestly, at half the price I still wonder if I would consider it worth it. You did indeed send me the remainder of your sample. 🙂 I’m not surprised you found it to be “meh” since you don’t like clean, soapy scents. But, even if you did, I don’t think you’d spend $205 on this one. LOL! I feel like it may have to be a Review en Bref from the sheer fact that you may feel compelled to scrub shortly after spritzing! Even if it became the most phenomenal scent after some time, nothing could make it worth the initial, putrid blast (which never goes away, IMO). Save it for a day when you have a sure thing to cheer you up! I noticed that you were looking for a green scent,Kafka. If you have a chance try Atelier Cologne Trefle Pur. I recently discovered it and its perfect for the springtime. Also, being a Cologne Absolue this stuff lasts quite a bit and has this amazing uplifting quality that I enjoy a lot. And it’s quite reasonably priced. This is another line that just leaves me cold. And the prices just make me mad! Heh. They are very high, but I must say, I very much liked Tobacco Vanille. And Noir de Noir lovely at first, though I’m not a fan of how much it resembled powdered Turkish Delight in its final stage. I was just in a Turkish delight haze yesterday! I stopped to sniff the new Sugar and Spice series when I spied the Cologne Intense Collection and had to smell that too. The Rosewater and Vanilla was actually my favorite. Who would have thought! Oh dear. The Dandy does feel that if a perfume advertises itself as being of a particular scent it should live up to that promise. Whilst I enjoy a sparkling adehyde I always feel that there needs to be a good degree of balance with another element to prevent the ‘soap effect’, though of course that is an historical curiosity as it is soaps that resemble aldehydes and not vice versa. It did disappear; that aspect to the perfume was only in the first hour to ninety minutes. Thereafter, it turned into an amorphous woody, soapy, aquatic floral with some green aspects, though not as green as they were initially. It certainly wasn’t a very hyacinth perfume on my skin. Alas. Alas indeed on two counts – I rather liked the sound of the unhinged green whereas I imagine you’re still on thee hunt for a good hyacinth. Just a thought, but apart from the two obvious and probably too green Chanel’s 19 and Cristalle – how about Hermes Jardin Nil, Diptyque Jardin Clos (thought it is a bit mossy) or most floral from Floris the old style Edwardian Bouquet. I’m sure you’ve tried but all do spring to mind – oh dear, unintended pun. Of course there’s hyacinth lurking in Fracas – but with that great big tuberose stealing every scene you’d never guess it! I’m really looking forward to trying your generous sample of No. 19 vintage Eau de Cologne, though I’ll need to do some reading on all the different formulations and versions out there if I were ever to do a review. As for Jardin sur le Nil, it wasn’t my cup of tea as it was too…. well, Jean-Claude Ellena. Plus, you know how my skin issues are ten times worse than yours, so you can imagine the longevity problem. But I definitely want to try The Dandy’s suggestion of Floris as a possible alternative to No. 19 if the latter doesn’t work out for me. Heh, your collection sounds like a dream! All heavy duty, all the time! I don’t have too many light things, save for a few. And I am so rarely drawn to them, sometimes I remind myself to wear them. I like the protective cloak feeling of those heavy, powerful scents that really make a statement. I’m sure it also has to do with the fact that our respective skins (and yours in particular) consumes perfume. Even powerful stuff usually plays fairly close to the skin for me, even if I get good longevity, thus “necessitating” heavier things if I want anyone else to smell them. Someday I will have to smell vintage Opium – I see them on eBay quite often for prices that aren’t too heinous. Have you ever smelled the men’s version, and is it good? Or are they even comparable to one another! Of course, Fracas is another I need to smell at some point. It seems to be a love or hate, so of course, I’m curious! Nice. I’m not a big fan of hyacinth so I think I don’t miss much not being able to try it. MANNNNN, I hated this thing. 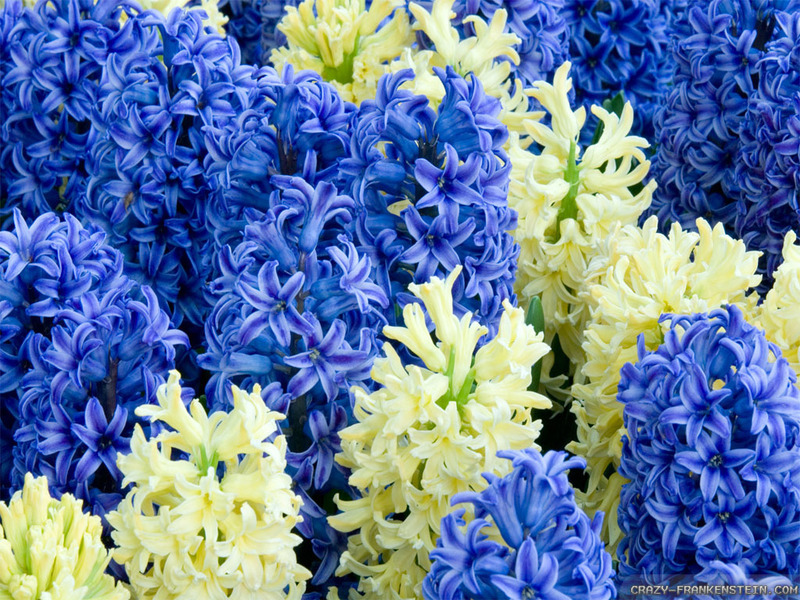 I like hyacinth and I love galbanum (and I often do okay with violet leaf), so I had high hopes. Nope. Metal, metal, dirt and fog. Should have called it Silver Shadow and maybe I’d have liked it better. But maybe not. Is this the EIGHTH thing we agree on?! Yes, I’m keeping score at this point, and it’s a lovely surprise!